This coming-of-age novel for middle-grade readers is about accepting and celebrating differences. Audrey is used to not fitting in. She knows she's different - even her little sister calls her "Nerd Girl". When her family moves to the country to live on a vineyard property, Audre... read full description below. This coming-of-age novel for middle-grade readers is about accepting and celebrating differences. Audrey is used to not fitting in. She knows she's different - even her little sister calls her Nerd Girl . When her family moves to the country to live on a vineyard property, Audrey makes a secret friend: a boy, Finch, who seems to understand her as nobody else can. 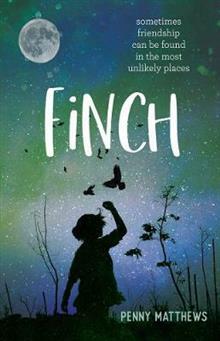 But there's something mysterious about Finch. Who is he, really? Penny Matthews has written more than thirty books for children and young adults. She writes in a variety of genres and has won many awards, including the Children's Book Council of Australia Book of the Year Award and the Davitt Award for Children's and Young Adult Literature. She is based in South Australia. Finch, a middle-grade novel, is her latest book with Walker.